Today’s Inspiring Slide was chosen by Classics MA student Lois Howorth who chose a little known painting by William Hogarth to write about. Find out how you could be inspired by the School of Humanities’ slide collection at the end of the blog. Hogarth, William, Mr Wood’s Dog Vulcan, c.1735, scanned from 35mm slide in Digital Humanities Centre, University of Nottingham. 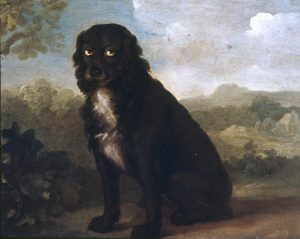 There is not a lot of information to be found about this painting of a black dog by William Hogarth. This was not the reason I chose the slide – I chose it, at first, because I liked the look of the image; I liked the dog’s soft black coat and round yellow eyes, I liked the soft blurred shadows of the English countryside which make up the backdrop. However, as the lack of information surrounding the painting became apparent, it raised in my mind an interesting point about the value of collections such as the slide library at the DHC. “…a note on the back of his painting ‘Mr Wood’s Dog Vulcan’ (c.1735) records that Vulcan attracted Hogarth’s attention by his nightly journeys carrying a lantern in his mouth to light the way home for his master, Thomas Wood…” – P. Beirne, Hogarth’s Art of Animal Cruelty: Satire, Suffering and Pictorial Propaganda. Returning to the painting armed with these scraps of knowledge, ‘Mr. Wood’s Dog Vulcan’ appears in a new light. His yellow eyes, so incredibly round, seem to glow like the lantern he had been trained to hold in his mouth, and the black fur of his coat fades into the shadows of the undergrowth. Each detail of the spaniel is treated with studied affection; the calm posture, the soft paws, the waves of fur about his ears. Without its being recorded on a slide, I would have never seen this dog, nor would I have learned the enigmatic trick it had been taught by its master, nor would I have investigated the career of a moralising 18th Century painter who had a great personal passion for the company and welfare of animals. The only image of the painting to be found online is grainy and low-quality, in contrast to the slide, which can be projected, or scanned and enhanced digitally, depending on the user’s needs. Thus, the value of the slide library at the DHC cannot be underestimated, as not everything can be ‘found on the internet’ – it is a useful store of images which may otherwise have been lost. Bierne, P. (2014) Hogarth’s Art of Animal Cruelty: Satire, Suffering and Pictorial Propaganda. Basingstoke. Hogarth, W. (1883) Remarks on Various Prints. London. Unglow, J. (1997) Hogarth: a Life and World. London. If you are a member of UoN’s Arts Faculty and would like to enter the Inspiring Slides competition, get your work posted here on Digital Dialogues and maybe even win a prize. Just choose a slide from the collection–any slide will do –and write a response to it. It may be a memory prompted by the slide or an immediate response in the form of a story, poem or even art work, or perhaps an examination or interpretation of the image. Prose need not be long, three or four paragraphs, 500 words is about average. If you cannot think of a particular image but fancy having a go, there is a selection of slides chosen exclusively by the DHC team on Lightbox one in the DHC. Choose an image, scan (yes we do have a slide scanner in DHC!) or take it away and let your imagination run wild! Inspiring Slides: James Malton’s ‘The Custom House, Dublin’ by Niall Walsh.